A fruit, in botanical terms, is an organ of the plant that contains the seeds. Seeds are fertilized, mature ovules. The ovules are fertilized in a process that starts with pollination (discussed in more detail later in this module). Fruits, on the other hand, are ripened ovaries or pistils that contain the seeds. In angiosperms, the fruit is derived from tissues of the flower. But fruits can also develop from other plant tissues. For example, accessory fruits develop from a ripened ovary or ovaries, but also include a significant portion derived from non-ovarian tissues. Figs, apples, pears, strawberries and cashews are examples of accessory fruits. 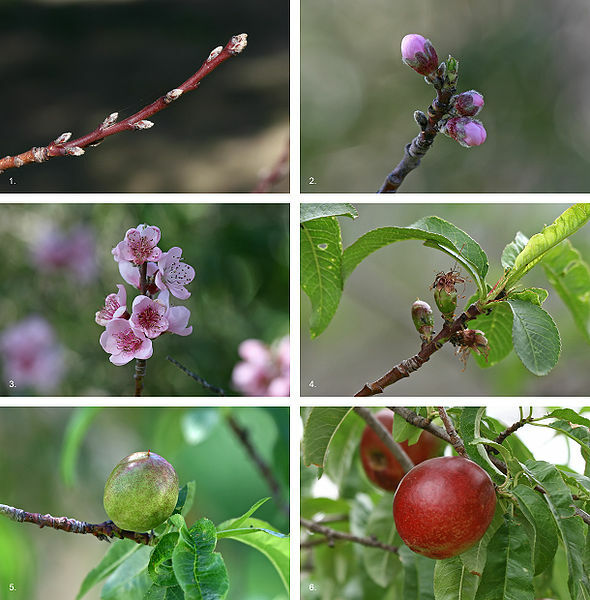 Figure 7.23: The development sequence of a typical drupe, the nectarine, over a 7.5 month period, from bud formation in early winter to fruit ripening in midsummer. 1. Bud formation can be observed on new growth on the plant (early winter). 2. Flower buds clearly formed and leaves start to develop (early spring, ~ 3 months). 3. Flowers fully develop and are pollinated by wind or insects (early spring, ~ 3 1/2 months). 4. If successfully pollinated, flowers die back and incipient fruit can be observed; leaves have quickly grown to provide tree with food and energy from photosynthesis (mid-spring, ~ 4 months). 5. Fruit is well-developed and continues to grow (late spring, ~ 5 1/2 months). 6. 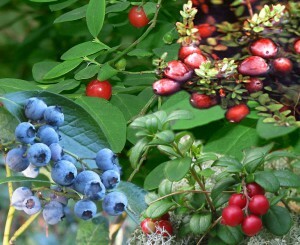 Fruit fully ripens to an edible form to encourage spreading of seed contained within by animals (midsummer, ~ 7 1/2 months). Many fruits are fleshy, sweet, and edible in the raw form – think of apples and oranges. 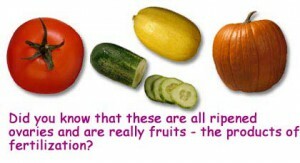 Fruits of plants that are typically not thought of as fruits include vegetables, pods, nuts, grains, ears and cones. These are all fruits since they carry the seeds of the plant. Keep in mind that commercial or colloquial uses of the term “fruit” do not include all botanical fruit types. There are many varieties of fruits and many terms for all the different kinds of varieties. In general, however, fruits can be placed into two groups: the fleshy fruits and the dry fruits. As you can see in the following figure, within these two general groups, many kinds of fruits occur. Simple Fruits: Fruits that develop from a single ovary. Examples include fleshy fruits like cherries, peaches, pears, apples, tomatoes, squash, cucumbers, and eggplants; and dry fruits like peanuts, poppy, maple and walnut. Aggregate Fruits: Fruits that develop from a single flower with many ovaries. Examples include fruits like raspberries, strawberries, and blackberries. Multiple Fruits: Fruits that develop from clusters of flowers on a single structure. Examples include pineapples, figs and beet seeds. Figure 7.25: Berries are an example simple fleshy fruit. 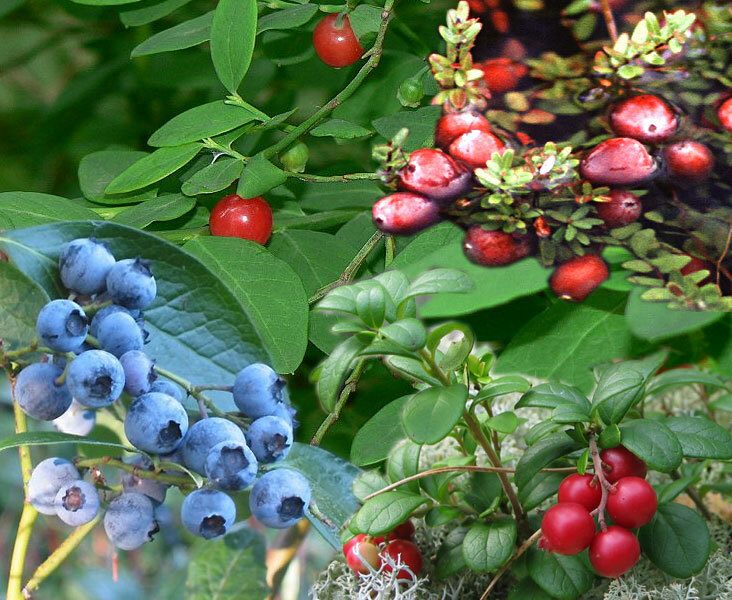 From top right: cranberries, lingonberries, blueberries red huckleberries. And, sometimes, to ensure the dispersal of the seeds the fruit carries. Many edible fruits are thought to have evolved specifically in order to entice animals to help with seed dispersal. In fact, some seeds must pass through the gut of an animal in order to germinate. The animal’s gut enzymes help to break down the tough seed coat allowing germination to occur. The variability in fruits represents different seed dispersal strategies. By looking at a fruit’s structure, one can predict the mode of dispersal the fruit would use. For example, seeds like those of maple and ash have “wings” for wind dispersal; other fruits such as those from the cocklebur and unicorn plant have barbs or hooks that catch on to fur or feathers and then travel with an animal until they are removed or drop off. To read more on seed dispersal strategies, click here. For more info on fruits, click here. In some non-flowering plants, reproduction occurs through spores, not seeds. For information on reproduction in non-flowering plants, check out this publication online (pdf).